Madagascar produces an amazing array of precious gemstones, agates and jaspers, fossils, and minerals. Madagascar is the largest island nation and the fourth largest island in the world. It is located off the southeast coast of Africa, in the Indian Ocean. The 1997 discovery of Sapphires propelled the country into the gemstone limelight. But political stagnation following a rebellion and an export ban on gems has created difficulties in obtaining the material. The export ban has finally been lifted, but the process of exporting has become very bureaucratic and time consuming. To make matters worse, most of the mining consist of hand dug pits, horizontal tunnels, and small scale mechanical operations. In 1997 sapphire was discovered in the Illakaka River, in the southern part of the island. They were so plentiful that you could just pick them up off the ground. And the region has much more to offer, including garnets, rhodolite, alexandrite, spinel, chrysoberyl, apatite, labradorite, quartz and more! Emeralds are found in the rain-forest region of eastern Madagascar, approximately 60 km west of the coastal city of Mananjary. Rubies are found in the city of Vatomandry, on the central east side of Madagascar in the province of Fianarantsoa. Labradorite is probably the most well known lapidary rock from Madagascar. Labradorite has an background color of dark gray, but it displays a beautiful iridescence, giving off rainbow-colored reflections known as labradorescence when light hits it in certain directions. Another very popular material is the lovely orbicular Ocean Jasper, from off the northwest coast of Madagascar. It can only be seen and collected at low tide. The area has no road, so the material must be transported to civilization by boat. It has since been played out. Other materials include Kabamba Jasper, Rhodonite, Polychrome Jasper, Celestite, Carnelian, lots of Agates from the agate field near Madagascar's west central coast, Amazonite, Rose Quartz, and Septarian Nodule. Of course, Madagascar is also well known for its fossils. It produces nicely preserved Ammonite fossils from both the Jurassic and the Cretaceous Periods. 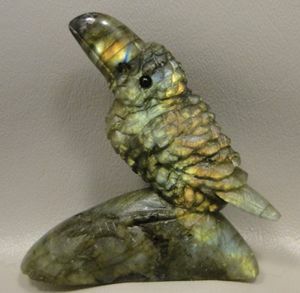 Under certain conditions related to fossilization, the nacreous shell becomes highly iridescent; the resulting gemlike material is called "Ammolite". All ammonite fossils from Morocco are polished or altered in some fashion as Madagascar export law makes it illegal to export "unprocessed" fossils. The world's oldest-known dinosaurs have been found on Madagascar. These dinosaur fossils date from 230 million years ago during the Triassic period. Other fossils found include Sand Dollars, and Trilobites. A beautiful red Petrified Wood is found in Madagascar. It is from the Triassic Period approximately 250-200 million years old. Petrified trees from Madagascar originate from an external source, meaning where they grew is not where they were found. They have no branches and no roots. They are mainly found in the Mahajanga region. Here at OakRocks we carry a lot of the various rocks and fossils from Madagascar. We have various items from rough rock, slabs, eggs, spheres, and animal carvings.